Out of Gas - Description | W. W. Norton & Company Ltd.
Science tells us that an oil crisis is inevitable. Why and when? And what will our future look like without our favorite fuel? Our rate of oil discovery has reached its peak and will never be exceeded; rather, it is certain to decline—perhaps rapidly—forever forward. Meanwhile, over the past century, we have developed lifestyles firmly rooted in the promise of an endless, cheap supply. 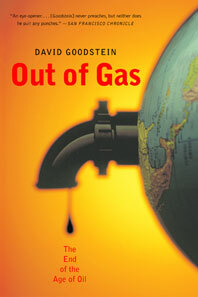 In this book, David Goodstein, professor of physics at Caltech, explains the underlying scientific principles of the inevitable fossil fuel shortage we face. He outlines the drastic effects a fossil fuel shortage will bring down on us. And he shows that there is an important silver lining to the need to switch to other sources of energy, for when we have burned up all the available oil, the earth's climate will have moved toward a truly life-threatening state. With its easy-to-grasp explanations of the science behind every aspect of our most urgent environmental policy decisions, Out of Gas is a handbook for the future of civilization.